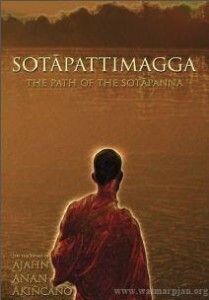 Sotapattimagga – The Path of the Sotapanna is a collection of talks was originally given to the monastic community at Wat Marp Jan in Thailand in 2008. As these talks were specifically directed to monastics, they often refer to many of the fundamental practices and routines of monastic life. In addition, one can find details on the higher . Though these talks were not originally aimed towards those in the lay life, laypeople dedicated to the practice are sure to find inspiration and benefit nevertheless.